Hotpoint toasters of the 1920s and ’30s were beautifully styled, reflecting current movements in architecture and design. 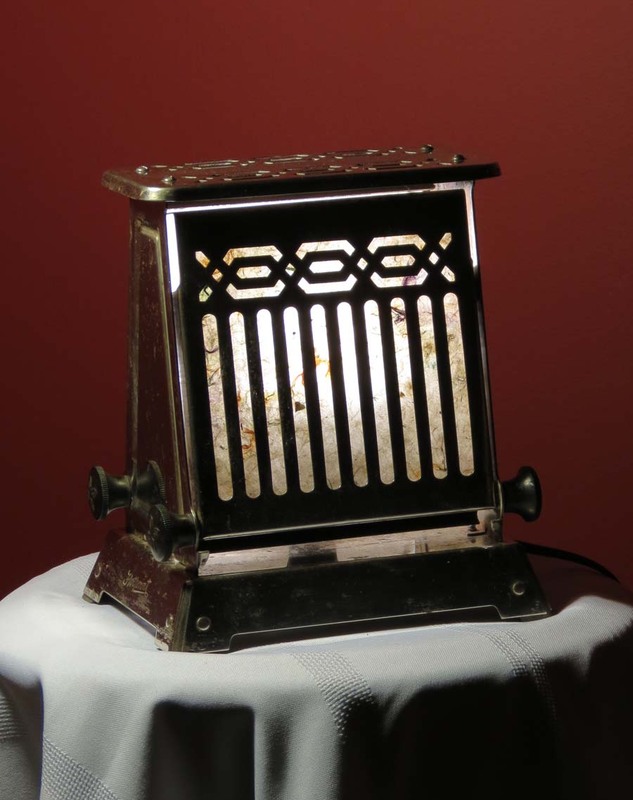 This chrome model, with it’s geometric basket weave cut-outs, is a double-sided flip toaster probably from the 30’s, with black bakelite handles that control the flipping down of the doors (so you could turn the bread around to get the other side toasted). The cut-outs have been backlit and highlighted using a cream-coloured Tibetan paper which is embedded with coloured yarn and rags, to give a stained glass effect. The paper liner is attached with magnets so, when you feel like a change, it can be replaced with a paper of your choice. The paper can also be removed from the back of the lamp, if desired, and this will not only make the lamp produce more light, but will also cast great shadows on the wall. The original heating elements inside have been removed, and a new candelabra socket installed which holds a 3 watt LED lightbulb. The LED bulb will not heat up even after hours of use, and will not scorch the paper – and it has a 25,000 hour life. Even if you have the lamp on 12 hours a day, every day, it should last about 6 years. All electrical parts are new. Supplied with approximately 6 feet of black vinyl cord with an in-line toggle switch. The 3 watt LED bulb is included.